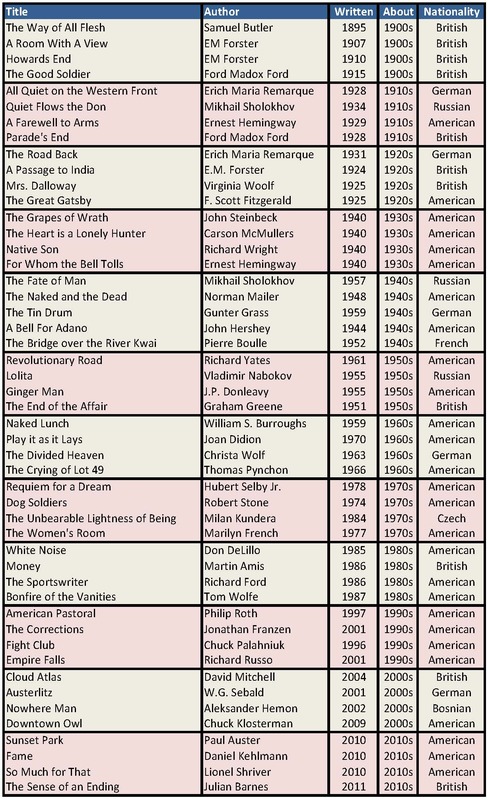 OK so in October 2011 I took a few cursory glances at the Modern Library’s Top 100 books of the 20th century list, and found to my chagrin and self-disdain that I am woefully under-read in this realm, and, worse, I have not even heard of many of the works & authors listed there. To my spreadsheet, I added the nationalities of the authors, and the years of publication (relying heavily on the Novels for Students database provided by the Gale Virtual Reference Library) and set to work on my project. I will read four books published during each decade of the 20th century, about that particular decade (or thereabouts). In this way, I am looking at the century through the eyes of the artists who lived in it. Industrialization, commercialization, war & holocaust, Americanization, disillusionment & disenchantment, the modern nuclear family, individualization. And meanwhile observe trends in the arts and literature. Post-modernism, writing explicitly of sexuality, unreliable narration, stream of consciousness, and other stuff I can’t think of because the last English class I took I was a sophomore in college. Also, I am lucky enough to work at a university library, so I can access the subscription databases and printed books and periodical literature to read top-notch criticism, which really enhances one’s experience of the books–perhaps a bit too much, speaking to the necessity of keeping one’s own notes. And we reach my problem. I did not keep good notes. I am now halfway into the 1930s and I have not written down my observations as I read the novels, I’ve only written down a smattering of quotations that struck me, and every book I have read has been checked out from the library which means I have no margin notes and no underlines and highlights to go back to. It’s quite distressing, as my brain has produced some rich insights and read some stirring quotes, but they’ve been dissolved with time. So I’ve started this blog to start keeping track of my notes and quotes, and I aim to go back and fill in my observations of the books I’ve read as I can. This last is fairly ambitious, but the good thing is I have time and I have no other obligations, having graduated from grad school last May and intentionally stayed out of a second masters so I could do stuff like this.